A mother and son walk toward the entrance of Martin Luther King Jr. Elementary School in Hartford, Connecticut, on February 23, 2017. In 2013-14, the nation’s 50 richest PTAs raised and spent $43 million dollars for the nation’s most affluent schools. PTAs fund programs, services, and staff for affluent students. High-poverty schools must spend limited public dollars—or go without. Districts can take policy actions such as pooling a portion of parent donations or regulating their use to benefit higher-poverty schools. States and districts should consider policies to offset school funding inequities caused by parent donations. This report contains a correction and updates. These numbers, however, do not illustrate the full picture of funding discrepancies. Average district per-pupil spending does not always capture staffing and funding inequities.14 Many districts do not consider actual teacher salaries when budgeting for and reporting each school’s expenditures, and the highest-poverty schools are often staffed by less-experienced teachers who typically earn lower salaries.15 Because educator salaries are, by far, schools’ largest budget item, schools serving the poorest children end up spending much less on what matters most for their students’ learning. In short, wealthy parents are raising large sums of money to improve their already-advantaged schools. In addition to having more experienced teachers, for example, higher-income students are more likely to attend schools with higher-quality facilities.21 And schools with robust and well-funded PTAs spend thousands of dollars per student to provide even better programming, including field trips, new computers, art and music instructors, and new supplies for teachers. In less affluent schools without parent donations, funding for these programs or resources likely comes out of schools’ overall budgets, requiring administrators to pull funding from other core activities for enrichment opportunities. Choosing among beneficial resources is especially difficult in states and districts with particularly low per-pupil spending averages. The national average per-pupil spending on public elementary and secondary education is $10,700; however, per-pupil spending varies dramatically across states.22 New York state spends an average of $19,800 on each student, and Massachusetts spends an average of $14,500. On the other hand, California spends an average of $9,200 per student, while Florida spends $8,400.23 The differences among these figures has a real impact on the options available to district and school administrators. Because of this, parent donations can have a greater influence in states or districts with low per-pupil spending, with every $1 equal to a greater proportion of overall spending. In these regions, parents can supplement public spending to minimize the tough budgeting decisions that will affect student learning. In fiscal year 2013-14, the nation’s 50 richest PTAs raised and spent $43 million dollars for the nation’s most affluent schools. These parent funds provide programs, services, and staff to affluent students; schools serving low-income students must spend public dollars to obtain these resources, if they can afford them at all. While implementing these policies can cause political pushback and be challenging to implement, addressing private donations is essential to achieving resource equity. In 2013-14, the 50 richest PTAs raised nearly $43 millionaround 10 percent of the estimated total $425 million raised by all PTAs in the country.25 On average, these PTAs raise around $851,000 per year, and the top 13 PTAs each raised and spent over $1 million in one year. For example, Robert S. Hyer Elementary School’s PTA in Dallas’ Highland Park Independent School District collected over $1.4 million, or $1,990 per student, and Highland Park High School’s PTA raised over $2 million—$950 per student. These PTAs predominantly support schools with very low levels of poverty. The national average of students who qualify for free or reduced-price lunch—the best indicator of socioeconomic status—is 50 percent;26 almost all these schools served school populations in which less than one-third of students were eligible for free or reduced-price lunches. Over 70 percent had fewer than 1 in 10 students who were from low-income families. In New York City, for example, the Lillie D. Blake Elementary School served 752 students—only 6 percent of whom are low-income—and in FY 2013-14, its PTA raised $945,000, or $1,260 per student.27 At Winn Brook School in Belmont, Massachusetts, where only 1 percent of students are low-income, the PTA raised $750,000 in that same period, or $1,680 per student. There were some exceptions. Brooklyn’s P.S. 261 served a student population in which 42 percent of students were low-income in the 2013-14 school year, and the PTA raised $723,000, or $900 per student. Despite the disproportionate concentration of PTA donations in affluent schools, we found that few of the districts with the 50 richest PTAs have policies in place to respond to outsized donations to the wealthiest schools.30 A couple of districts place restrictions on how parent-raised funds can be spent, such as banning their use to pay for school staff. For example, the Rockwall Independent School District in Texas allows PTAs to donate nonpersonnel items to schools, such as equipment, but not to support staff salaries.31 Beyond this, however, parent donations in these districts are largely unregulated. See Appendix Table 2 for the full list of districts this report considered. In some of the nation’s most affluent schools, PTAs have been able to raise and spend hundreds of thousands—even millions—of dollars to supplement public funding in a largely unregulated environment. These resources are simply unavailable to students in poorer schools, who must make do with public funding alone. This situation inevitably contributes to educational inequalities—even though it is completely hidden when looking at public spending. To understand how PTA contributions influence districts and schools, this report looks in depth at parent fundraising in one large city: Washington, D.C. On the whole, the District of Columbia serves a high percentage of students living in poverty; around 75 percent of students in D.C. Public Schools, or DCPS, are from low-income families.32 Throughout the city, however, there are pockets of wealth. In 2013-14, the district’s five wealthiest PTAs—associated with schools serving an average of only 8 percent low-income students—raised a total of over $2.9 million for schools located mostly in Northwest Washington.33 The top PTA was Janney Elementary School’s, which raised almost $1.4 million—about $2,220 per student—while the next four PTAs each raised between $460,000 and $300,000. These funds paid for after-school programs, equipment, arts programs, and various enrichment activities. Some of this revenue comes from fee-for-service after-school programs.34* Meanwhile, in the district’s highest-poverty schools—mostly located in Southeast Washington—schools had to pay for some of these same programs with public dollars, leaving less funding for other resources, staffing, or education or enrichment activities. See Appendix Table 3 for more on the district’s five wealthiest PTAs. Lower-income school communities in Washington, D.C., are at a clear disadvantage when the largest parent-teacher associations in the area can mobilize millions of private dollars to substantially enhance their schools. By providing resources to schools without factoring in the role of outside dollars, Washington allows the most affluent students and their schools to receive more money than the students and schools who have the highest need. Some districts have policies to temper the impact of parent donations. One approach is to restrict how schools can use donated funds, specifically banning the use of parent donations for school staffing. Schools can use these dollars for other forms of enrichment, such as field trips or new after-school activities. However, school or district leaders cannot use these funds to purchase new staff positions, such as new art teachers, additional math teachers, or classroom aides. Generally, this restriction prevents PTAs from influencing school staffing arrangements. We compared two districts to assess the effect of this restriction on fundraising rates and found evidence that these policies may have very little impact on parent contributions. Montgomery County Public Schools in Maryland does not allow parent contributions to influence school staffing. Montgomery County itself is a suburb directly outside Washington, D.C., where the median household income for families with children is $115,700.41 Montgomery County serves around 150,000 students, 35 percent of whom qualify for free and reduced-price lunch.42 Around 70 percent of students in Montgomery County are students of color. One of the district’s largest cities is Bethesda, Maryland, where the National Institutes of Health are headquartered. Since 1989, the school district’s board of education has regulated how private donations can be used in schools. Specifically, the board’s policy stipulates that “funds raised by fund-raising groups cannot be used to employ anyone to work in the schools during the regular school day.”43 Among other restrictions, this means that schools can only use parent donations to supplement schools’ activities, such as field trips, or to provide enrichment activities after school, such as student chess clubs. Over the three-year period from 2012 to 2014, PTA fundraising looked similar in both the Montgomery County and the Anne Arundel County school districts. Montgomery County PTAs raised around $70 per student during the years 2012 through 2014, while the PTAs in Anne Arundel County raised slightly less—around $60 per student. 50 In 2014, Montgomery County PTAs raised four times as much—around $2.9 million dollars in total—compared with Anne Arundel County PTAs, which raised around $700,000. The difference in total revenues is largely a result of district size, as there were four times as many students represented by the Montgomery County PTAs. After accounting for differences in how much families earn, both districts’ PTA revenues remained steady during this time period, with per-pupil PTA revenues equal to 0.06 percent of the income of the median household with children. In both districts, schools serving the most affluent students received tens of thousands of dollars in additional funding each year from parents, while the highest-poverty schools received very little, if anything, from their PTAs. In Montgomery County, for example, the PTAs of the 10 most affluent schools raised at least $700,000 in 2014, or an average of $170 per student, and the PTAs of Anne Arundel County’s 10 most affluent schools raised at least $240,000, or an average of $100 per student. In both districts, students in high-poverty schools did not benefit from this influx of parent contributions. Unfortunately, we could not locate financial data for every PTA, so we could not identify PTA revenues for all of the most affluent and highest-poverty schools.51 Based on available information, however, we expect that, with more financial information, the total PTA revenue for the most affluent schools would be even higher, and students at the highest-poverty schools still would receive minimal parent contributions. Furthermore, our analysis suggests that a prohibition against using parent donations for school staffing does not influence contributions. During the years studied, Montgomery County’s policy likely did not depress PTA fundraising. Despite the prohibition, the most affluent families in Montgomery County still provided hundreds of thousands of additional dollars to enrich their children’s school experiences. And in both Montgomery County and Anne Arundel County, parents donated a similar share of their families’ overall budgets. Paying attention to parent donations alone is therefore likely not enough to reduce staffing inequities. Montgomery County’s policy ensures that parent dollars do not exacerbate these inequities, but it does not address deeper staffing disparities that frequently occur between the most affluent and the least affluent schools. It is important to note the limitations of this analysis. We did not compare parent donations before and after Montgomery County implemented its policy and therefore cannot know the policy’s full impact on parent contributions. It is possible that, absent the policy, parents would be donating even more than they did in the years of the data we analyzed. To better understand the sizable impact of these policies, we compared parent contributions in Portland Public Schools with parent contributions to Seattle Public Schools, a district of comparable size and demographics that does not have an equity fund. We found that policies that equitably redistribute donations—or divert a portion of the contributions to affluent schools to high-poverty schools with more significant need—did not substantially reduce overall parent contributions. Even if the policy has caused a dip in contributions, the benefits have outweighed the costs. Portland Public Schools has been able to leverage parent fundraising to benefit its highest-needs schools in ways that Seattle’s most disadvantaged schools do not. 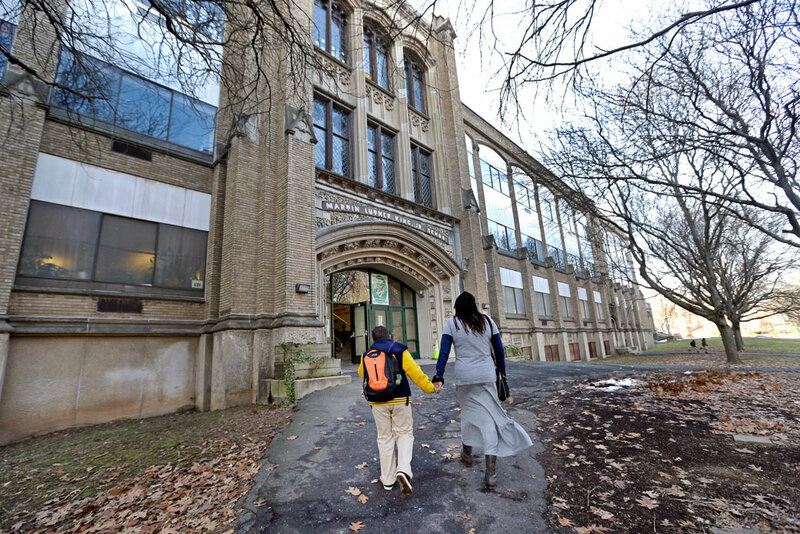 In 2013-14, for example, the 10 most affluent schools in Portland raised at least $750,000, while the 10 highest-poverty schools received very little money in parent donations. Through equity grants, however, the high-poverty schools received at least $270,000, substantially narrowing the parent funding gap.62 In Seattle, on the other hand, the 10 most affluent schools received at least $1.6 million, while the 10 highest-poverty schools did not receive any parent contributions or additional funds through redistribution. Given that financial data was not available for every PTA, we could not identify PTA revenues for every one of the top 10 or bottom 10 schools.63 With more financial information, it is likely that overall PTA revenues for the most affluent schools would be even higher. Districts should pay attention to these concerns and considerations as they work to improve equity. Similar to the limitations in our analysis of the impact of donation usage restrictions, we cannot assess the full impact of equity funds on parent giving because we did not analyze Portland’s parent donations before and after it implemented the equity policy. However, our research suggests that equity policies did not significantly reduce the amount of parent donations. Therefore, district leaders might be able to implement redistributive policies—such as the equity fund featured here—without the risk that parents will take their dollars outside the school system. To address the outsized influence of parent donations on school finance, states and districts can take several steps to ensure that schools serving disadvantaged students have all the resources that they need in order to provide students an excellent education. The first three recommendations address resource equity more broadly, while the remaining recommendations focus specifically on parent donations. As a component of new state plans required under the Every Student Succeeds Act, states should promote greater transparency around private dollars by encouraging districts to require schools to accurately report and publicize private contributions. Greater awareness around the inequity of private dollars is an important first step to gain community buy-in for policies to allocate resources equitably.70 Prioritizing accurate reporting should also make it easier for districts to consider private donations in their larger budgeting decisions. Districts should launch an annual needs-based assessment initiative to evaluate programs, services, and staffing on every campus, and they should use this information to adjust all of the resources and funding they allocate to individual schools. This will help ensure that every school has the resources it needs to provide a high-quality, well-rounded education to its students. One way to do this is through weighted-student funding. In such systems, the district allocates resources to schools based on student enrollment, where students with more risk factors receive more funding weight. For example, a student from a low-income family could count for 30 percent more than a base per-pupil allocation, or a student with a disability could count for 100 percent more than the base allocation. Ultimately, schools with higher numbers of at-risk students receive more dollars per student. Nevertheless, weighted-student funding or other systems to distribute funds based on need cannot make all dollars equal. Even if high-poverty schools receive more money, some programs or uses, such as facilities upgrades or enrichment activities, are more easily purchased with private, less-restricted dollars, such as those provided through parent donations. Policies that reduce the inequities of parent donations are often difficult to implement and can influence overall parent giving. Different approaches may be more viable in different districts and less likely to affect parental engagement. Districts should assess donations’ impact, as well as community openness to reallocate donations, to determine the best approach to address district inequities. The following policies offer different strategies to combat inequities. Districts should consider the advantages and challenges of each strategy when selecting a policy to implement. We recommend that districts pool a small portion of parent contributions to redistribute to high-needs schools, similar to the policy in Portland, Oregon. Our research suggests that districts can establish and grow equity funds based on parent donations without seeing a significant reduction in affluent parents’ contributions. These policies, however, are politically challenging and can receive significant pushback from some families in the community. We also recommend that district leaders follow Montgomery County’s approach and put restrictions on how schools can use parent donations, including banning the use of private dollars to pay school staff. These restrictions can help ensure that all schools have access to equitable public funding to meet their staffing needs. Affluent schools will not be able to use the donations to supplement their staffing budget to hire additional staff. This approach likely does not affect the amount of parent donations since the dollars stay with the designated school, but it does not resolve resource inequities. Districts should not be blind to the impact of parent donations when developing their school budgets. These funds are real sources of revenue, they can be significant, and they are often predictable. Districts should consider parent donations when determining how to direct funding from a district-wide donation, grant, or unexpected budget surplus. Districts should project each school’s yearly private contributions based on PTA revenue and subtract that amount from the amount the district plans to allocate to each school. This approach would minimize the risk of parents reducing their contributions since the redistribution of funds happens before any district funding is appropriated to a school. The donated dollars would remain with the designated school and the shifting of resources would occur during the larger, nuanced budget process. Districts should also encourage donations to funds or causes that promote district-wide opportunities. For example, districts can partner with and direct parent contributions to community organizations that offer enrichment programs to multiple schools. Rather than using the private funds to supplement an art teacher’s salary at one given school, for example, a local art museum can increase programming for the entire district. Incentivizing this type of giving will increase the number of students who benefit from parent contributions and maintain parents’ autonomy to direct their dollars as they see fit. Fundraising is one way for parents to engage with their schools.76 But there are political obstacles to reforming school finance policies, particularly when it comes to private dollars. Even if districts successfully implement policies to redistribute parent dollars and reduce funding inequities, they might still risk broader disengagement by affluent parents. Efforts to promote equity of parent donations can also unintentionally set up conflicts within communities, especially among parents across the socioeconomic spectrum. Despite these risks, achieving resource equity is impossible unless all inputs are considered. Districts cannot ignore the hundreds of millions of dollars in hidden money that PTAs generate for affluent schools. States and districts must think systematically to ensure that all students—regardless of their families’ wealth—attend well-resourced schools. States and districts should promote transparency and create structures to ensure that annual school funding allocations consider all inputs and reflect each school’s specific needs. Districts must analyze the political environment in their community and implement an approach that will align with donation patterns as well as the community’s political will. Catherine Brown is the Vice President of Education Policy at the Center for American Progress. Previously, Brown served as the vice president of policy at Teach for America and as a senior consultant for Leadership for Educational Equity. Previously, Brown served as senior education policy advisor for the House Committee on Education and Labor, where she advised Chairman George Miller (D-CA). In 2008, Brown served as domestic policy director for Democratic presidential candidate Hillary Clinton. Previously, she served in Clinton’s Senate office as a legislative assistant. Scott Sargrad is the Managing Director of the K-12 Education Policy team at the Center for American Progress. Prior to joining CAP, Sargrad served as the deputy assistant secretary for policy and strategic initiatives in the Office of Elementary and Secondary Education at the U.S. Department of Education, where he had the primary responsibility for key K-12 education programs and initiatives, including the Title I program, Elementary and Secondary Education Act flexibility, and School Improvement Grants. He joined the department in 2009 as a presidential management fellow in the National Institute on Disability and Rehabilitation Research and also worked as a senior policy advisor in the Office of Planning, Evaluation and Policy Development. Sargrad received his undergraduate degree in mathematics with a minor in philosophy from Haverford College and a master’s degree in education policy and management from the Harvard Graduate School of Education. Meg Benner is a Senior Consultant to the Center. Previously, she was a senior director at Leadership for Educational Equity. Benner worked on Capitol Hill as an education policy adviser for the House Committee on Education and the Workforce, where she advised Ranking Member Rep. George Miller (D-CA) and served as a legislative assistant for Sen. Richard Blumenthal (D-CT) and Sen. Christopher Dodd (D-CT). She received her undergraduate degree in American studies from Georgetown University and a master’s degree of science in teaching from Pace University. The authors wish to acknowledge several people who helped with this report. We would like to thank David Rosenberg, partner at Education Resource Strategies, who reviewed a draft of this report and provided valuable comments that strengthened the framing and policy recommendations. Brendan Duke, Associate Director of Economic Policy at the Center for American Progress, and Tim Daly, founding partner for EdNavigator, also offered meaningful comments. Finally, we wish to acknowledge Samantha Batel, a Policy Analyst at the Center, who collected and analyzed school finance data for this paper. * Update, April 18, 2017: This report has been updated to clarify that IRS Form 990s include all PTA revenue, regardless of source. Authors’ analysis of IRS Form 990 data, based on available data from Guidestar and the IRS. We focused on 37 out of 72 PTAs in Portland and 38 out of 80 PTAs in Seattle.